Don’t forget that this Tuesday, 25th September 7pm, is very important! Please support the club if you can attend. 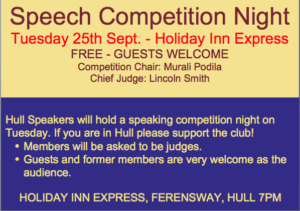 It is the Speech Competition! We need judges, too. 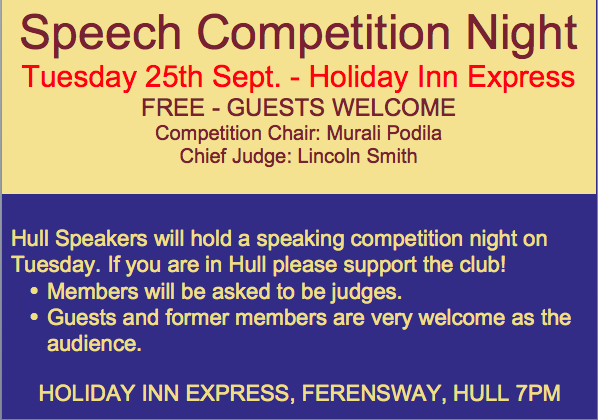 Members can be judges and you will be given a list of criteria to grade speakers against. Visitors are very welcome. The event is free. PLEASE SUPPORT YOUR CLUB IF YOU CAN ATTEND THEN DO MAKE THE EFFORT. THANK YOU. ⟵Lucky Dip: What Did We Choose?